On March 17 the Jernigan Institute conducted simultaneous meetings of BELL Academy coordinators and the Research and Development Committee. Though we met in separate rooms and on separate floors, we were all going about the business of creating greater opportunities for blind people. But when the evening came around, it was time to acknowledge what was going on in the wider world, and that was the celebration of St. Patrick’s Day. Our dinner offerings were Irish stew or corn beef and cabbage, a healthy serving of potatoes, a healthy salad, three varieties of cheese, and a wide selection of fruit. I don’t know that I can put the word healthy before the brownies, so how about yummy as a substitute for that oh so necessary adjective. But the meal was just the beginning of the evening. 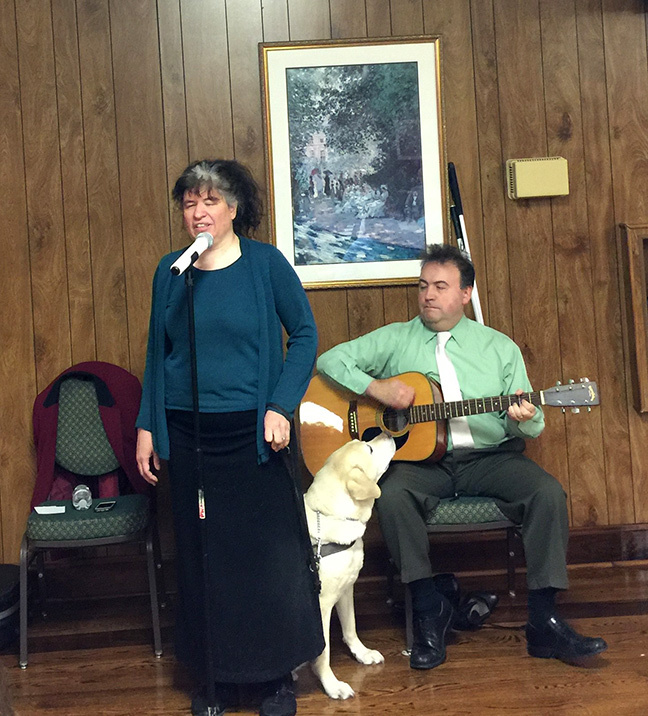 Carla McQuillan loves to sing Irish ballads, and all of us had song sheets either in Braille or print so we could join her in singing and clapping during the bridge. 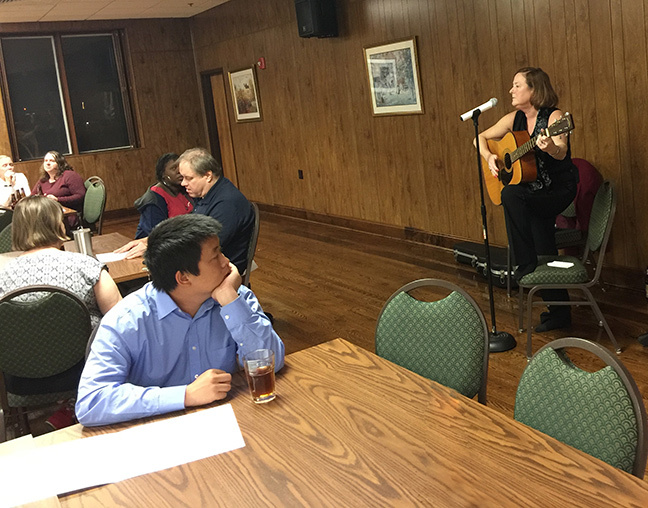 Like every great performer, Carla took an intermission, and in her absence from the stage we were entertained by Melissa Riccobono and her accompanist on the guitar, Mark. Melissa has started a project to bring the community together through music and to help raise money for deserving charities. She and Mark gave us a sneak preview of what will be in her first show, and clearly it is going to be a good one. I don’t think there could have been a better way to end a weekend of work then through this celebration. We enjoy working hard, but we also enjoy letting our hair down and playing together. Thanks to the great musicianship on the stage and the audience who made up the chorus, we made a joyful noise that must have made happy the leprechauns that were certainly among us.